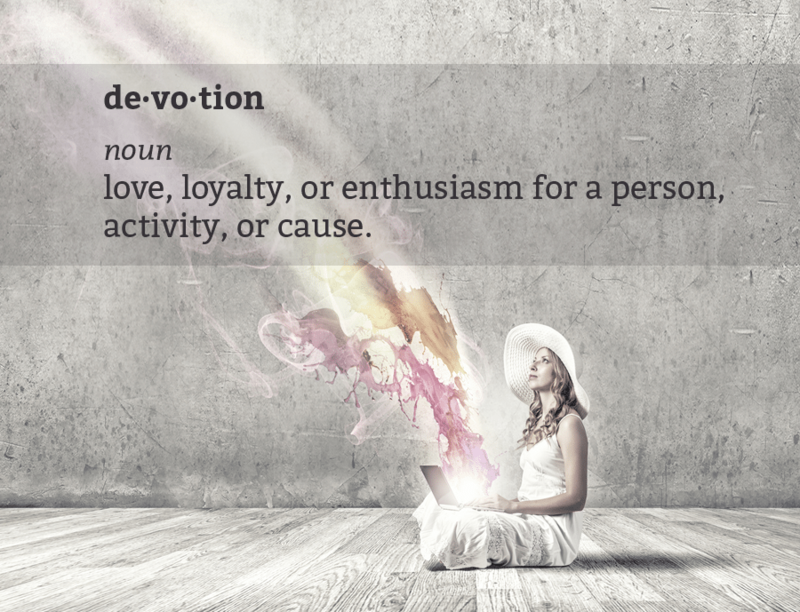 Devotion is a beautiful thing, isn’t it? When you’ve got a person, a creation, or a cause that tugs at your heart — and you can give yourself over to it a little bit each day — life has meaning. That’s what writing is for me. A way to make meaning. To gather like-hearted souls around a cause. To inspire positive change. Whether it’s about your business, your community, or something larger, there are people out there — other human beings — who want and need to hear what you have to say. Your voice is required now more than ever, if we’re going to turn this world around. And whether you write or speak them, your words have the power to inspire, teach, and agitate others into taking action. But first you need to find those words, right? Or, more specifically, first you need to listen to them. Because here’s the truth: Your voice isn’t something outside of you. It’s not something you look for on a retreat, or discover in a workshop. (Nope, not even in this program.) It’s not something that someone else can give you. Your voice is intrinsic to you. And yes, it’ll grow and develop over time; but only if you devote yourself to the listening. Only if you commit to digging deeper into what you mean, and then writing and sharing what you’ve written with others. And because most of the process is solitary, we writers can — inadvertently — become lonely and discouraged. At times, you may lose confidence in your own creativity. And begin to doubt your own voice. When that happens, you could find yourself avoiding your your pen and paper, procrastinating, or just plain shutting down. This problem of isolation is why I started the Writers’ Devotion Circles (previously the Writers’ Masterminds). And I’m happy to say that those who participate say they feel more connected, supported, and SEEN. Today I’d like to invite you to join us for the next wonderful round. 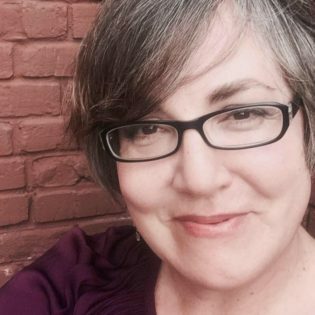 For over three years, I’ve led dozens of folks through a comprehensive and positive-focused feedback process — one that’s proven to increase your confidence, creativity, and skills as a writer. For 2017, my entire focus centers around your writing and this approach. A mentor and network of peers to provide unconditional support and accountability so you have every opportunity to succeed. A feedback process that encourages and sparks your creativity. Guide you through two 90-min small group (no more than 6 people) critique/feedback sessions per month (six sessions total). Meet with you privately twice for 30-min to discuss direction of your writing. Review up to 10,000 words of your writing and provide you with line-by-line suggestions and comments. Inspire you weekly via email. Provide you with technical and moral support as well as keep you accountable to your goals via a private Facebook group. Research shows that when we focus on what isn’t working, we interrupt the imaginative flow and create almost impossible odds for ourselves creatively. But when we put the emphasis on what lights us up — what stands out as beautiful and resonant, we’re inspired to build on that and it’s easier to slip into a flow state. And from there, we’ll also share something that we felt could be clarified, expanded, or simply moved around. These devotional feedback sessions are built on mutual trust and support. Your cohorts become your writing family. In addition to sharing our writing and developing our voices, we trade stories of our work and challenges, our leads and resources. We laugh at rejections and encourage each other to keep our commitments to our messages. We help you identify your innate genius message and then galvanize you to lean into it. 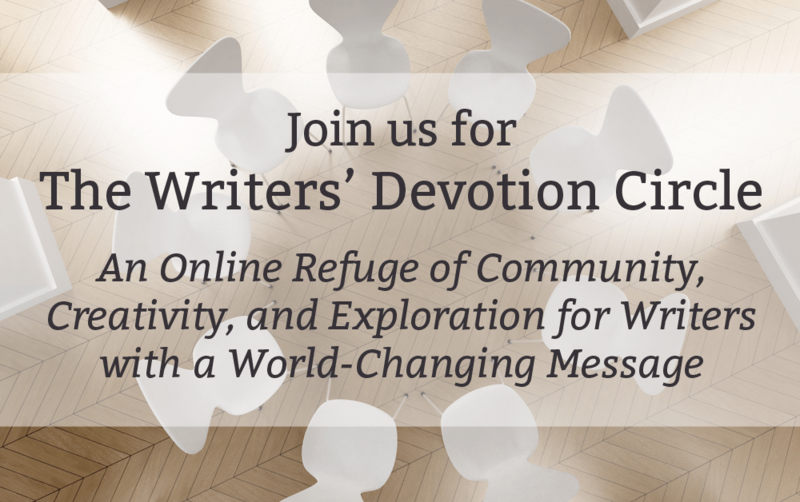 Is the Writers’ Devotion Circle for You? If you’re working on a memoir, a trade book, a nonfiction how-to work, short stories, articles, or essays with a positive message for hope and change, and you’d like to make those works your most beautiful expressions, then yes, this program is for you. The Writer’s Devotion Circle is structured to cater to most folks as long as they are committed (devoted!) to doing the work and to being of service to their cohorts. Previous participants have been unpublished writers just starting out; folks with books-in-progress; mid-career writers who wanted to move higher in their industry, post-grads with MFAs; and those considering new genres. If you yearn for a solid writing community and a trusted mentor who will support you and keep you accountable, this program is for you. If you want to go deeper with your writing and be encouraged and coached to become a better storyteller, this program is for you. If you have concerns about the technology or the timing or any piece of what we have planned, we can discuss all of that during our intake interview (see below for more information). Every writer will — at one time or another — struggle with how to get the writing done. Call it resistance if you like. It is simply an opportunity to exercise your devotion. In that spirit, we will share and discuss several writing tools and resources for everything from starting to staying organized to getting published. We’ll explore things like Proprioceptive Writing, Freewriting, Pomodoro Technique, and others. These 30-minute (recorded) sessions feature guest writers from different genres who’ll talk about everything from Show vs. Tell to dialogue to how to stay inspired and connected to your voice so you get more (great!) writing done. These modules cater to all genres whether you’re writing a how-to, a memoir or a novel. Confirmed guest mentors for this round are: Desiree Adaway, Isabel Faith Abbott, Cigdem Kobu, Jena Schwarz, Kelly Diels, and Crys Wood. Each week, participants showcase 500-800 words for review in our private Facebook group. We generously comment on where your work has energy, what shines, and where to focus your writing time. This gives you the surety of where your words sing, so you have the motivation to keep working. Combining this kind of feedback with the work we do in our live sessions is the best way to move your work to the point of publication. We’ll meet every other week via video-conferencing in small groups (no more than 6 people per group) for 90 minutes so that you can enjoy LIVE discussion and feedback from the group about your work. All writers are given a chance to ask questions, express needs, talk about doubts and wins. There will be a variety of dates and times to choose from so we can accommodate as many time zones and schedules as possible. Please discuss your availability with me when we chat during the pre-enrollment interview. You’ll meet privately with me twice (once when we start, and again toward the end of our time together) to discuss your goals and challenges and develop a plan of action that works for YOU. Every two weeks, you’ll revise your writing based on your group’s feedback and then submit it to me for line-by-line suggestions and additional coaching. This gives you an additional chance to go deeper into your message and how you want to express yourself. Each time you publish something you’ll be encouraged to share a link to that piece with our entire group. We’ll help you practice talking about your published work on social media so it gets the highest mileage possible. Your cohorts will also be encouraged to share your links with their folks (where it makes sense to do so). I used to call this program a ‘writers’ mastermind,’ but the work we do here isn’t about the logical brain. It’s not about mastery over the writing process, it’s about being of service to (devoted!) a cause or a message with your voice. It’s also how you’re of service to your fellow participants. Hi there, I’m Téa (pronounced Tay’ah). I’ve been writing stories and poems since I was old enough to hold a pencil. In college, as an English major, I studied the fine points of metaphor and character and meaning. And when I left, I joined the world of marketing and put my superpowers to work helping all manner of organizations large and small. Over the last decade, I’ve coached and mentored hundreds of small business clients, helping them create clear and compelling branding stories and marketing content. I’ve also published two books, created several unique projects, and been a guest writer on a handful of semi-famous blogs (from Copyblogger to HuffPo). This unique program (I’ve not found another one like it!) is the result of over three years of refined development and my heart’s best work. I’m honored to be here with you. NOTE: There are two generous (50%) scholarships available for The Writer’s Circle through Story Bistro. Preference will be given to those writing in a social justice capacity. If you’re interested in a scholarship, please apply here. The deadline is January 10, 2017. Enrollment Fee: $350 a month for three months OR one payment of $925. In addition, there will be six mini-seminars on the weeks between your small group meetings. These seminars will be scheduled for the convenience of the guest mentor who will be speaking (usually a Monday or a Thursday morning), and recorded for all those who can’t attend live. Once you choose your group, you may not swap out to another group (they are small and limited to six people each). You also need to be sure that you can attend all six of your small group sessions (you don’t have to bring writing to each meeting, but you need to commit to attending). If you feel that this program would be a good fit for you (and we’ve not worked together before), the first step is to set up a pre-enrollment interview and save your seat with a $100 deposit. If, after we chat, you decide that it isn’t for you, your deposit will be fully refunded. If you know you want in, and we’ve already worked together before, you can simply email me to let me know and we’ll get you set up. Your payment (whether in full or with the first of three installments) is the balance (so either $825 or $250 for the first payment) and will need to arrive shortly thereafter to secure your spot. There is space in this program for just 36 people (six groups of six). This allows me to devote quality time and attention to you and your writing. Before you enroll, I’d love to chat with you about your specific needs, wants, and availability. This will help me place you in the right-for-you Devotion Circle. Right now, I’ve got circles open on Mondays, Tuesdays, Wednesdays, and Thursdays. NOTE #1: If you live outside the U.S., please email me to inquire about pricing for your country. NOTE #2: Once the program begins, there can be no refunds. Please choose wisely. The program starts the week of January 23, 2017. There’ll be at least four different sub-groups (up to six) with different dates and times available for you to choose from. We’ll determine these as we progress through the interview process and you’ll select the best date/time for you and your needs. Once you’re in a particular small group, that will become your writing family (no switching groups). Please discuss this with me during your pre-enrollment interview. Each of our mini-seminars will take place at various times according to the needs of our guests. In terms of the live Devotional sessions, there will be at least six different meeting times to choose from throughout the week. We will determine which time works best for you when we talk during your pre-enrollment interview. Once we begin the program, we won’t be able to refund your enrollment fee. This is why we ask you to chat with us beforehand to ensure a good fit. Consider your options carefully and don’t rush into anything. I’m just starting out as a writer, is this a good program for me? If you’ve not yet established a website or other format for publishing, you will be at a disadvantage when we encourage sharing; but otherwise, as long as you have a fairly good grasp of the English language and can manage the technology we’re using, you should be fine. We’ll discuss any concerns you might have during your pre-enrollment interview. What platforms and technologies do you use for this program? In addition to the writing you’ll do, you’ll also want to have about 4-5 hours per month available to attend meetings and provide feedback to your fellow participants. This program doesn’t really work for me. Do you have any other options?